Premium Fabric Softener is a concentrated fabric softening liquid specially formulated for use in commercial and on premise laundries. The product is suitable for application on most types of fabric and can be manually or auto-dosed. • Excellent softening of many types of fabric (towels, sheets, wool, delicate articles etc). • Leaves a smooth, silky feel on woven or flat knitted fabric. • Contains a perfume, which leaves a pleasant smell on fabric. • Prevents build-up of static electricity on synthetic fabrics. • Delivers a pleasant long lasting residual smell. 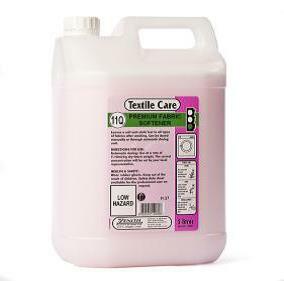 • Contains cationic surfactant to assist ironing/ calendering.